It will be a battle of defense between the Bears and Niners. If you like defense, you&apos;ll love the game between the 7-2 Bears and the 6-2-1 Niners tonight in San Francisco — they strut their stuff on Monday Night Football. But if you love seeing points on the board, odds are you may be disappointed. These teams are stingy in that catergory. While all the news has been swirling around the health of both teams starting quarterbacks all week, the game is now the focal point no matter who is under center. Like the Bears&apos; Jay Cutler, San Fran quarterback Alex Smith suffered a concussion last week. The Bears said Friday that Cutler would sit out Monday night&apos;s game. Smith initially got the OK to return to the practice; however, reports Monday indicate he will not be starting tonight. Back-up Colin Kaepernick will get the start; he has been used this season in the “wild cat” offense. This is a key NFC match up and the winner can crow that they are the best in the conference. Last year, San Francisco was a game away from the Super Bowl, and well, we know what happened with the Bears missing the playoffs. . . . These two defenses are both at the top of their respective games and expectations are high. What&apos;s up with the Bears defense? The toughest test of this game for Brian Urlacher and the Bears&apos; defense is stopping the number one rushing offense in the NFL. The big threat is running back Frank Gore, who is "very under-rated," according to Urlacher. "He does a lot of their dirty work," Urlacher said. "You try to wrap him up, but he is going to make some plays." Gore and his teammate Kendall Hunter both average over five yards a carry, running behind a big, athletic offensive line. The Bears defense has feasted on every team they&apos;ve played, forcing turnovers; this may be key to help their offense, especially if scoring is difficult. One week it&apos;s Tim Jennings grabbing interceptions, another it&apos;s Major Wright or D.J. Moore. But the one player in every Bears opponent’s head is Charles Tillman. His ability to punch the ball out of a running back or receivers hands has to be so intimidating at this point. Tillman will also have a tough match-up, with San Francisco’s Michael Crabtree — he is their go-to receiver. Tight end Vernon Davis is not having the season he had in 2011, but he&apos;s still a vital player for San Francisco Coach (and former Bears QB) Jim Harbaugh’s offense. How about the Bears “O” — or will it be uh-O? With the quarterback situation now in the hands of back-up Jason Campbell, look for improvement from last week’s emergency play. The former Oakland/Washington starter had a week to work with the first unit and a week to get ready for a very formidable defense. Last year the Bears stumbled with back up Caleb Hanie; now they have a quality player. Campbell will be scrutinized as Jay Cutler has been all season. Last week the Bears offensive line did not give up a sack; this week they will have to contain Aldon Smith with his nine-and-a-half sacks. 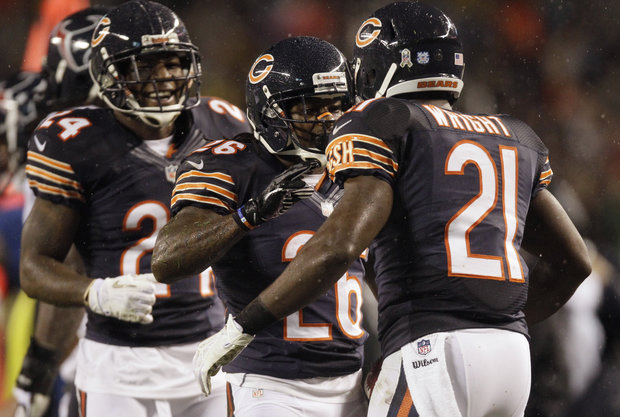 Running the football with Matt Forte and Michael Bush will be a major endeavor for the offense. They will be going into the strength of the Niners defense — linebackers Patrick Willis and NaVorro Bowman. This tandem is held in the same high regard as the Bears linebackers Urlacher and Briggs. If the Bears want to have success they still need to get the ball into the hands of Brandon Marshall; he is a big play receiver and it will only help stretch the field. Two people are on the hot seat. First, punter Adam Podlesh: He has struggled this season and is near the bottom in the league. He had to be looking over his shoulder since the Bears tried out a couple of punters this week. Second, offensive coordinator Mike Tice: He has to make sure his game plan will be executed, particularly in the red zone. Conference wins may be an important factor, in case, the Bears need to win a tie-breaker to determine a playoff spot. The Bears will not care about leaving their heart on the Bay; they want to leave physically intact — and with a win.